Green building is no longer a trend. Since the publication of the widely read first edition of this book, green building has become a major advancement in design and construction. Building codes and standards have adopted much stricter energy efficiencies. Businesses, institutions, and communities have discovered huge savings, along with health and marketing advantages, in sustainable building. Private facilities, as well as public buildings for Federal, state, and local governments are increasingly required to design and build sustainably in both new construction and renovation. With a new chapter on greening of commercial real estate, this reference is a one-stop resource for the latest in green building approaches and implementation. RSMeans is North America's leading supplier of construction cost information. A product line of Reed Construction Data, RSMeans provides accurate and up-to-date cost information that helps owners, developers, architects, engineers, contractors, and others to carefully and precisely project and control the cost of both new building construction and renovation projects. In addition to its collection of annual construction cost data books, RSMeans also offers construction estimating and facilities management seminars, electronic cost databases and software, reference books, and consulting services. Part 1: Green Building Concepts. Chapter 1: Green Building Approaches. Designing for People: Health & Productivity. Chapter 2: Introduction to Green Building Materials & Systems. Green Material Alternatives by CSI Division. Chapter 4: Efficient Use of Energy & Other Resources. Understanding Occupants’ Needs & Expectations. The Building Envelope & Systems Interactions. Renewable Energy & Distributed Generation Technologies. Chapter 5: Solar Energy Systems. Background: Energy, Economics, Environment, Health & Security. Energy Use in Different Types of Buildings. Applications & Concerns: An Overview. Basic Criteria for Using a Wind System. Evaluating the Local Wind Resource. Estimating the Cost of Wind Systems. Connecting Wind Systems to Utility Grids. Chapter 7: Health, Comfort & Productivity. Part 2: Designing, Specifying & Commissioning the Green Building. 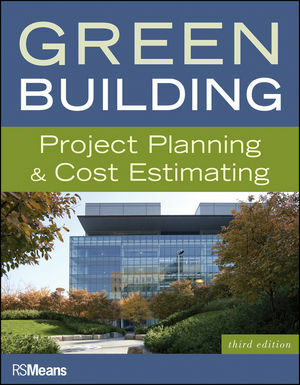 Chapter 8: The Green Design Process & Associated Costs. Team Building & Goal Setting. Cost of a LEED® Rating. Design Team Statement of Work. Bid Solicitation & Contract Award. Establishing a Green Team in an Existing Facility. Chapter 9: Rating Systems, Standards & Guidelines. Whole Building Multiple Attribute Ratings. Whole Building Single Attribute Ratings. Chapter 10: Budgeting & Financing Construction. Chapter 11: Specifying Green Products & Materials. Building Product Manufacturers & Green Products. Who Selects Green Building Products? When Are Green Products Selected? Chapter 12: Commissioning the Green Building. Part 3: Analyzing Economic & Environmental Impacts. Chapter 13: Economic Analysis & Green Buildings. Supplementary Measures of Economic Evaluation. Basic Steps in LCC Analysis. Selection Criteria for Supplementary Measures. Chapter 14: Evaluating Products Over Their Life Cycle. Measuring Economic vs Environmental Performance. Overall Performance: Economic & Environmental. Chapter 15: Evaluation, Analysis & Data Tools. Codes & Standards Compliance Evaluation. Chapter 16: The Greening of Commercial Real Estate. Factors Limiting the Adoption of Green. Appendix A: HVAC Equipment Efficiency Tables. Appendix B: Additional Information on Standards & Guidelines.